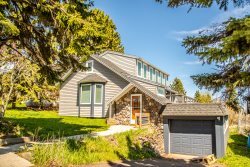 Enjoy a week or a weekend at this spacious 3-level vacation rental home with panoramic views of Lake Superior. Aspenwood 6520 is a modern townhome located on the shores of Lake Superior in Tofte, MN. This 3-bedroom, 3-bathroom, 3-story vacation rental home is spacious and great for a large group. With multiple Aspenwood townhomes available to rent, you can bring the whole family and have plenty of space for everyone. Aspenwood 6520 has a spacious living area. Enjoy cozying up in front of the gas fireplace in the living room. The living area is a space for family and friends to gather and connect. No matter where you are in the living area you will be able to see and speak with your friends and family. The incredible views of Lake Superior can be enjoyed from the living area windows. Or step out onto the lake-facing deck and enjoy even more Lake Superior views. The modern kitchen has gorgeous countertops and full sized appliances. The kitchen features a dishwasher, great for not having to hand wash dishes on vacation. Enjoy Lake Superior views while you prepare a meal in the well-equipped kitchen. The dining room table seats 8 so everyone can enjoy a meal together. You can enjoy the Lake Superior views while dining, as well The master bedroom has a king sized bed and electric fireplace. Wake up to the sounds and sights of Lake Superior from the master bedroom. The master bedroom also features an in-room jetted tub The attached master bathroom has dual vanities and a walk-in shower. The master bedroom balcony is yet another spot where you can enjoy the Lake Superior views. The first guest bedroom, located on the upper level, has a queen sized bed. This room also has an attached bathroom. The attached bathroom has a shower/tub combo and large vanity. The third bedroom, located on the main level, has a full sized bed. The lower level living room is yet another great spot where everyone can spend time after a long day of exploring the North Shore. Sit back and watch a show on the Fire TV or Satellite. The views of Lake Superior abound from this room, as well The sleeper sofa in the lower level living room provides another sleeping area. The game table in the lower level is a great place to play some cards. The walk-out patio provides easy access to the Aspenwood grounds. At the far end of the property there is a staircase leading to the 600` of Lake Superior Shoreline shared by all Aspenwood units. This gorgeous cobblestone beach is the perfect place to skip rocks or have a summer bonfire. Dip your toes in the cool Lake Superior waters during the summer months. The grounds of Aspenwood feature a bench to sit and enjoy the views, as well as other places where you can grab a seat and just enjoy the views. The community fire pit is great for roasting marshmallows and sharing stories of your North Shore adventures. Need more space There are lots of Aspenwood units available to rent through Cascade Vacation Rentals. Choose from 1, 2, 3, and 4-bedroom units. Another fabulous vacation townhome rental in the prestigious Aspenwood Series, 6520 is a spacious 3-bedroom, 3-bathroom, 3-story unit. This home features 2 spacious living areas, great for large groups of friends and family. Enjoy the 600 feet of cobblestone beach and the spectacular views that Aspenwood is known for. Lake access via a steep set of stairs. Skiers and bikers are welcome. The 1 car garage is available to store your winter gear or bikes in the summer. Take advantage of everything the area has to offer or stay in and do nothing at all. Either way, Aspenwood has what you are looking for. Aspenwood is centrally located, close to many North Shore attractions. Here you are just a short 8-mile drive from Lutsen Mountains, a premier winter ski resort and summer recreation destination. You are also just a short drive from hiking, golfing, biking, cross-country skiing and more. Superior National State Park hiking trails, Oberg Mountain, Sawbill Trail, Gitchi-Gami bike trail, Tofte Park (with Lake Superior boat launch), and Temperance River are just a few of the attractions just minutes away. Need more space? Check out all of our Aspenwood Townhome options! We have 1, 2, 3, and 4-bedroom options available. Rent multiple units for larger parties and make Aspenwood your destination for a family reunion! Allergy Warning: Guests with pet allergies should be aware that while this property is NOT a pet-friendly rental, the owner has a pet and there may be some hair/dander present. IMPORTANT NOTICE: The staircase to the beach was washed away in a storm. A new staircase is being planned but currently not available. There is no access to the beach area until the staircase is replaced. Photos of the beach are for reference only. Due to Limited Spaces, Snowmobile Trailers Not Recommended. The WiFi wasnt working upon our arrival, but we were able to get that resolved with one call to the office. We greatly enjoyed our stay in Aspenwood 6520. It was very spacious and comfortable, and having a great view of the lake was a nice bonus. Big 3 story townhouse with everything you could need, besides a hot tub. Wonderful views of lake superior. Terrific unit in a great location. Wonderful layout especially with a family of college age and adult children. Everything we needed and then some. Rented in the past and will continue to use Cascade Vacation Rentals......lots of options! The property was very clean and comfortable. Love the view of the sunrise from the spacious deck! Nice addition of the stairs down to the lakeshore which had amazing views. Only negative was the dull lighting over the dining table. Also loved having the space in the garage for all our bikes and easy access to the barbeque. Thank you for having us, it couldn't be any better with the most amazing view. Cascade Vacation Rentals was (again) so easy to use. We've booked on the N Shore three years with this company. We've never had any issues. Check-in and check-out are easy. Payment is easy. Just over-all easy. We were sent an email about a possible 50% discount to extend our stay - which we were able to take advantage of. We really enjoy the emails weekly about rental properties and the N Shore. I won't use anything else when booking on the N Shore. The condo was as great and gorgeous as the photos, which isn't always the case. The location is perfect for our wants/needs. We like the location near Tofte. Zero complaints on the condo. We loved having a garage. The lake views were amazing. The kitchen had everything we needed. The beds were comfortable. When we walked in and saw the beautiful view of the lake, we were hooked! We loved the roomy and nicely decorated townhome. Access to the beach was difficult and was not used but once. CVR staff is the best! There is no other Vacation Rental company that comes close. They are friendly, organized, accommodating, detail oriented, and so much more. This property has so many positives! The location and views hit you right when you pull up, but the home itself is so beautiful. It is warm, and inviting with large windows and decks that face the lake - which is almost close enough to touch. The main level is open to the kitchen, living & dining which makes it a great spot to hang out! The master suite is heavenly with plenty of space and a huge jetted tub. This unit has everything you need with lots of extras. Too many great things to list. We will definitely be back!